The escape wheel rotates clockwise, as seen from above in this view. The entry pallet is the first to meet an escape wheel tooth. 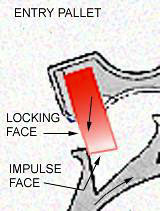 As illustrated, the locking face of the pallet locks against the escape wheel tooth and the pressure of the escape wheel “draws” the pallet down against the tooth (this is called locking to the draw). As the balance impulse jewel comes around, hitting the fork of the escape wheel, the escape tooth is released. The escape wheel tooth rides up the inclined impulse face of the pallet, impelling the pallet away. This is called the impulse. 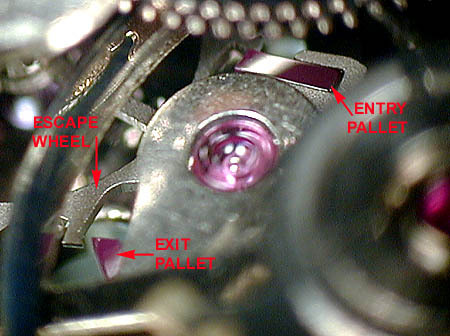 The illustration below shows the entry pallet beginning to lock, the exit pallet just following an impulse (and unlocked).